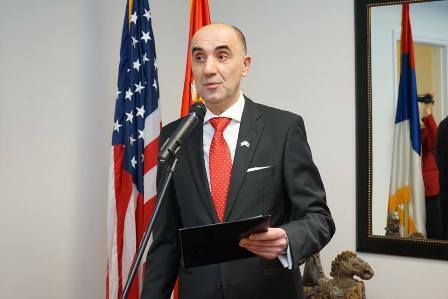 Acting Consul General of the Republic of Serbia, Dejan Radulović, held a reception on the occasion of February 15th - Statehood Day of the Republic of Serbia. 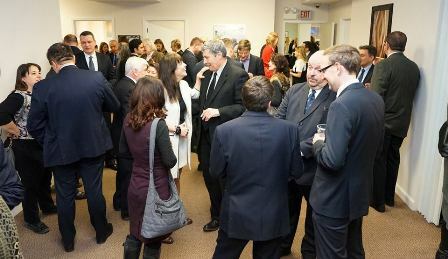 The reception was attended by representatives of the State of Illinois, the City of Chicago, representatives of the consular corps, representatives of Serbian organizations and associations, representatives of the church and prominent individuals of the Serbian community, as well as other public representatives from Chicago. The reception began with the intonation of the anthems of the Republic of Serbia and the USA, which were sung by opera singer Sladjana Sarić. Attending guests were addressed by the Acting Consul General, Dejan Radulovic, who recalled the historical events related to the Statehood Day's date. He emphasized the importance that Serbia attaches to the development of bilateral relations with the United States, the appreciation for US support to Serbia in the process of European integration, especially highlighting the intensification of further enhancement of economic cooperation. In this context, Consul Radulovic recalled the alliance of Serbia and the US during the First World War, as well as the centenary of July 28, 1918, when, by the order of President Wilson, the flag of Serbia was displayed on the White House and other state institutions in Washington in recognition of the gratefulness of the United States to the Serbian people and the Serbian army for their contribution to the Great War. He also emphasized the role of the Serbian community in the United States in the relations of the two countries, its contribution to the development of the city of Chicago and conveyed readiness for further deepening of cooperation between the sister cities of Belgrade and Chicago. Governor of the State of Illinois, Bruce Rauner and the Mayor of the City of Chicago, Rahm Emanuel sent letters of congratulation on the occasion of the Statehood Day of Serbia. You can see the gallery of reception photos here.